Spend an evening in Monaco to see the principality truly glitter with a 5-hour night tour. Go for a drive on the Basse Corniche road to the Vista Palace Hotel in Roquebrune-Cap-Martin, where you'll be rewarded with gorgeous views of Monaco all lit up. In Monaco itself, see how the Prince's Palace and Monaco Cathedral shine at night. Enjoy the romantic evening charm of Monaco-Ville, the historic center of Monaco. Check out the grandeur of Casino Square as men and women dressed to the nines head in for some high-end gambling. Take advantage of some free time to wander around Monte Carlo on your own or get dinner in one of the trendy restaurants (own expense). Group size is limited to eight people to ensure more personalized attention from your guide. 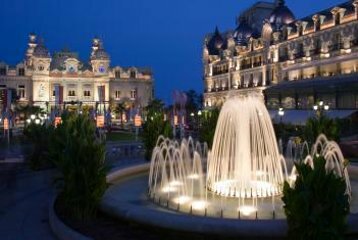 Begin your evening tour with pickup at your hotel in Monaco and drive east on the Basse Corniche road toward the Vista Palace Hotel. As the road climbs, you'll get better and better views overlooking the Mediterranean – passing the Medieval town of Eze on the way – until you arrive in Roquebrune-Cap-Martin and the Vista Palace Hotel perched on a hill. 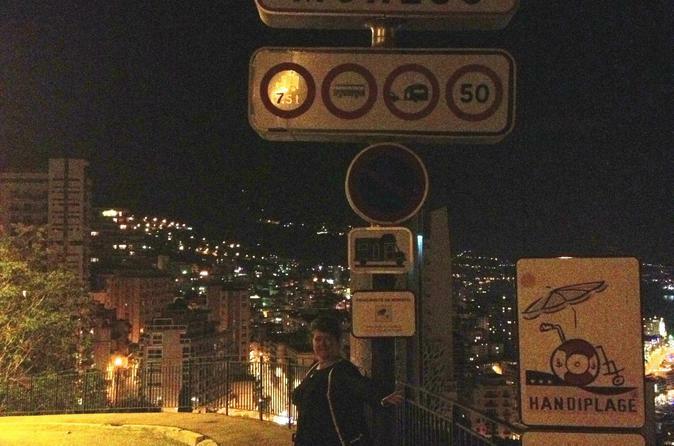 From there, the view down to an illuminated Monaco are splendid. Drive into glitzy Monte Carlo and take a moonlit stroll through Casino Square. Check out the opulent casinos and luxury hotels, not to mention the well-heeled clientele in both. Enjoy some free time here to take a romantic walk, try your hand in one of the casinos or have dinner in one of the chic restaurants nearby (own expense). Take another drive along the Basse Corniche to appreciate the views after the sun has gone down and, at the conclusion of your tour, get returned to your hotel in Monaco. This tour offered a perspective you could only get at night. This sparkling lights over the city, mountain, and harbour were spectacular. Our guide, Jennifer, was both knowledgeable and personable and gave a great tour. This was a wonderful tour and Sebastian really made this our tour. We even had time for a fantastic dinner! We were able to see all the places of interest in Monaco and he even added a few extras that we would have never had without him as our tour guide! Sebastian was knowledgeable and he made this tour one of the most enjoyable of all our vacation! Lovely tour drove round Nice stopped off for a meal and then toured Monte Carlo!!! Alex was brilliant!!! Would highly recommend to see Monaco by night. The tour provides a lot of free time for dinner or a trip to casino. Worth it! Brett our driver and guide was very informative and accommodating. Fab tour! really nice guide and loved seeing the whole area. The casino is set up very badly for tourists. I went there long ago and just walked into yhe main casino.. too bad it is now so touristy. The rest of the tour was lovely!!! A lovely night that started with a coastal drive and then a tour of the mountains surrounding Monaco. Our driver and guide was wonderful, we couldn't have asked for better. He took photos of us, was informative, answer all our questions We loved him.Seeing everything at night was different and gave us a new perspective. After our tour we had free time in Monaco to enjoy the restaurants and casino, he gave several suggestions on places to go. We completely enjoyed out night tour and would do it again. Well worth it to see Monaco and the drive is amazing sights.